a) cost leadership strategy: the firm delivers same quality and service at a lesser cost. This could be through efficient processes, cheaper raw materials or other value engineering means. b) differentiation strategy: the product or service ie., value offering of a company has unique qualities that customers pay extra for it. A patented product is an example of a differentiated offering. Technology or superior quality helps in differentiation, that helps command a premium for it. Thus, differentiation strategy provides a platform for higher growth of profits. c) niche market strategy: here, the enterprise focuses on a narrow market segment and becomes the biggest fish in the smaller pond and achieves higher profits. Whichever the strategy a business enterprise uses, it requires the quality of ENTREPRENEURSHIP to succeed. Firms requires the buzz - ideas, they need to be driven to take chances, firms should be energetic and nimble. Entrepreneurship within organizations at all levels helps firms survive and grow. Epigenetics: Conrad Waddington (1905 to 1975) is said to have coined the term epigenetics in 1945. Epigenetics refers to a phenomenon where there are heritable changes in gene expression without changes in DNA sequence. 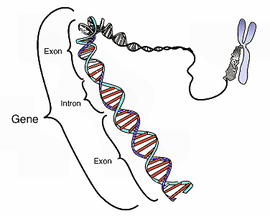 The above is a part of a DNA which is a unit of heredity (ie., gene). It codes for some trait, for eg., colour of the eyes. We normally understand that this part of DNA (ie., gene) is responsible for the characteristics in the offspring or the individual. Today, science has established that the expression of the genetic trait can change; even though the DNA sequence has not changed! So the blueprint DNA is not the only responsible factor for genetic expression. So the person may have a DNA code for blue eyes, but it may not be expressed due to epigenetic changes. Let us say, there is a gene responsible for hereditary diabetes in a person. However, the expression of this genetic trait (to cause hereditary diabetes) need not take place even though it is in the genes of the offspring! That is what the field of epigenetics says! Genome is the entire set of hereditary information in the organism. The genome and - the dietary or nutritional or environmental factors interact, this shapes and influences the genome. This is to say that nongenetic factors interact and influence how the genes behave. Eg., even if the genetic predisposition to obesity is not there, the lifestyle - diet - other environmental factors influence the genetic function, and the net result may be that the person becomes obese (even though genetically he or she is not inclined to be obese!)! What this goes to say is that GENES are not everything, there is a phenomenon called epigenetics that influences genetic functioning, gene expression, and consequently onset of disease or expression of traits. Epigenetics presents the power of change, above the level of genes! It represents an intervention that can change things for the better. Thus, even if a person is predisposed to Alzheimer's disease (AD), through an understanding of epigenetics, one can intervene through dietary or nutritional or other factors and influence gene expression, and thus can potentially prevent occurrence of AD in an individual. Epigenetics literally means "above genetics". Epigenetics represents hope. Epigenetic changes are responsible for health and disease. DNA methylation (a chemical reaction where methyl group is introduced in to the DNA), is a epigenetic change and is thought to be responsible for diseases like inflammatory bowel disease. Epigenetic changes can be corrected through nutritional interventions like folic acid supplementation. 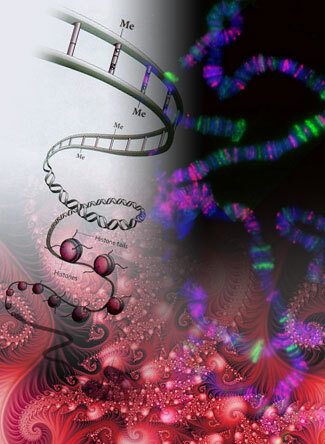 In epigenetics, non-genetic factors cause genes to behave differently. Genes code genetic information. But this is only one part of the story!! Entrepreneurship is about converting innovation in to economic goods/services through business and financial acumen. Entrepreneurship provides hope by filling market gaps through value. Entrepreneurs make profit through their entrepreneurial activities. However, for every successful entrepreneurial story, there are scores of entrepreneurial losses. It is a part of the game of entrepreneurship! For every Big Bazaar (supermarket) success story, there is a Vishal (supermarket) that is in loss! This is like epigenetics! Even if it is not in the genes, epigenetics can change the story coded in the genes!! Even if entrepreneurship is not coded in organizational DNA, it can be induced!! Entrepreneurship can change things in the market unexpectedly! Entrepreneurship is the game changer, like epigenetics!! Entrepreneurship is the cardinal tenet of business. The moral of the story is that entrepreneurship is required to get the competitive advantage in today's fierce marketplace. Even if entrepreneurship is not there in the DNA of the organization, taking a leaf from epigenetics - is a ray of hope! Epigenetics changes gene expression!! Entrepreneurial business culture can be injected in to any organization to change organizational expression!! Thanks for reading this blogpost, please scroll down and read all other posts, click on older posts as and when required, please recommend this blog too! Love this post, Sunil. Like all your other posts, this is well researched and brings simplicity and connectivity to relevant issues. Just an observation: the final quote on the role of business was by Peter Drucker, I thought. I don't know if Milind Kundera said it before Drucker. Two examples of people who come to mind when you think of epigenetics are (i) Nandan Nilekani - a Chitrapur Brahmin from South Kanara - who broke the mould of the community and became an entrepreneur unlike most others who are bank officers and in similar services (ii) MK Gandhi - a Gujarati who shunned wealth and business to live an ascetic's life. Lets hope that pharma companies move against their grain and begin to think of the greater good to humanity than merely creating profit. Particularly distressing is the 5.5% surge in Pfizer Inc's stock price when the CEO announced downsizing R&D as his strategy! One shudders to think of the trend that this might set in the industry when the leader sends such signals. Many thanks for your kind comments and spending time on my blog. Knowledge is fascinating, with new scientific insights like epigenetics becoming popular. In this article I have tried to co-relate biology with management science! Yes, even I thought the quote of Peter Drucker's, however, the book I referred to gave the quote credit to Milind, so I have gone with this. The site is about entrepreneurship and epigenetics, several of the genes involved in the proteins that help guide epigenetics. It looks at changes in the activity of genes and try to investigates how environmental agents, including the foods you eat influence on these. Thanks a lot.